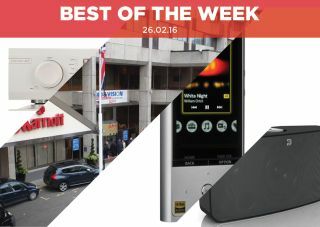 Best of the Week: Bristol Show 2016, Sony Walkman, cassette tapes and more | What Hi-Fi? This week Foxconn's buyout of Japanese display manufacturer Sharp was held up, Roksan announced the Radius 7 turntable and Musical Fidelity launched the feature-packed M6 Encore 225. In terms of reviews we had Sony's entertaining NW-ZX100HN music player, the big Bluesound Pulse wireless speaker and the stylish BeoPlay H8 headphones from Bang & Olufsen. Musical Fidelity is set to launch the M6 Encore 225 and it's a product which almost defies classification. It plays and rips CDs (to a 1TB hard drive), can be used as a DAC and an amplifier and, to add to its list of tricks, is completely upgradeable too. Right now it's in the prototype stage but if you happen to be at the Bristol Hi-Fi Show this weekend, you can see it in all its glory. Foxconn's acquisition of Sharp continues to rumble on. With a $5.4bn bid already accepted by Sharp's board, Foxconn have gone back and revised figures regarding contingent liabilities i.e. costs that may occur in the future. Despite the hold up, Foxconn are reportedly keen to seal a deal that would give respite to the embattled Japanese manufactuer, which has come under financial pressure in recent years. Roksan's Radius turntable is making a return and you'll be able to hear it at the Bristol Show. Carrying on from the award-winning Roksan 5.2, the motor has been redesigned, the plinth boasts a new glass finish and a Nima tonearm will come with the turntable. Check out room 416 at the Bristol Show for a listen. "At £500, it hits the sweet spot at being an affordable player that offers a touch of premium quality"
The NW-ZH100HN slots in the middle of the NW-A25HN (£250) and the NW-ZX2 (£900) and marries the best elements of those two efforts. Its crisp and clear sound makes a good fit for high-res files, however it can be a touch too polite, not unearthing as much detail as it ought to. Despite that it impresses with its solid build quality and easy to use interface. The ZX100HN comfortably sits between offering affordability and premium quality. "You’ll struggle to find a wireless speaker at this price with a more solid, smooth and expressive midrange"
We're big fans of Bluesound and it's delivered another notable effort with its hefty Pulse wireless speaker. As we've come to expect, the sound is detailed with plenty of punch and an expressive mid-range. Bass, while impressively weighty, could be better defined. It's the one area where it falls down. Regardless, the Pulse is at home whether it's playing MP3s or hi-res music. "B&O can be hit-and-miss when it comes to getting enough sound for your pound, but we’re happy to report this time it’s a hit"
Bang & Olufsen is nothing if not stylish but that style comes with a hefty price tag. Thankfully the H8 is not all about looks. It boasts noise cancelling and Bluetooth and performs well in the sound stakes with good dynamics and details, though not as good its rivals, which brings the price back into the spotlight. If a stylish, well-featured pair of headphones are your thing, then they're worth considering.